This toy expo is perfect for Rio's post-periodic exams treat! Nanays, you can drop by Toy Kingdom's Amazing Toy Expo at the SMX Convention Center this coming weekend and celebrate the end of the first grading period with your amazing kids. We are happy to know that most of our favorite toy brands are participating in this expo. We hope to find Lego items on sale so we can get a box for our little homeschooler. If you are one of those early Christmas shoppers, don't miss this chance to get the latest toys for your inaanaks. These include toys from Trolls, Suicide Squad, Star Wars, classic Disney Junior; and the first Filipino Plush toys Plush and Play. Kids will love the new Barbie You Can be Anything collection and My Little Pony. There will also be a Betty Spaghetti Launch and Meet and Greet sessions of Shopkins and Cartoon Network’s Power Puff girls. They will enjoy Marvel’s Avengers Metals Die Cast, the latest Lego Nexo Knights and Transformers. They will also have a thrilling ride at the Hot Wheels Treasure Hunt series, and be able to meet and greet the famous squad of Teenage Mutant Ninja Turtles. During the event, kids can also Meet and Greet well loved characters from Nickelodeon’s Paw Patrol, the Grossery Gang, and more. 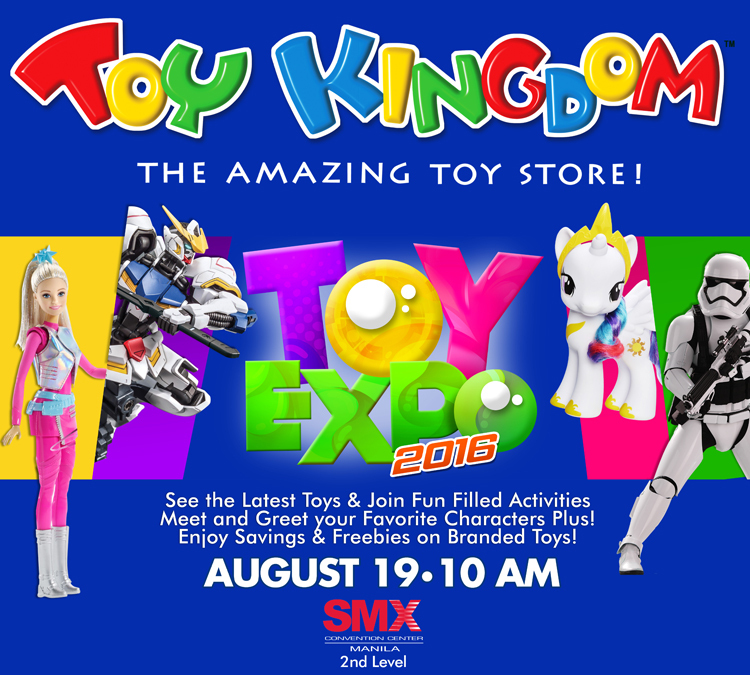 Check out Toy Kingdom’s Toy Expo 2016 at 2nd level of the SMX Convention Center from 10am to 10pm on August 19-21, 2016. 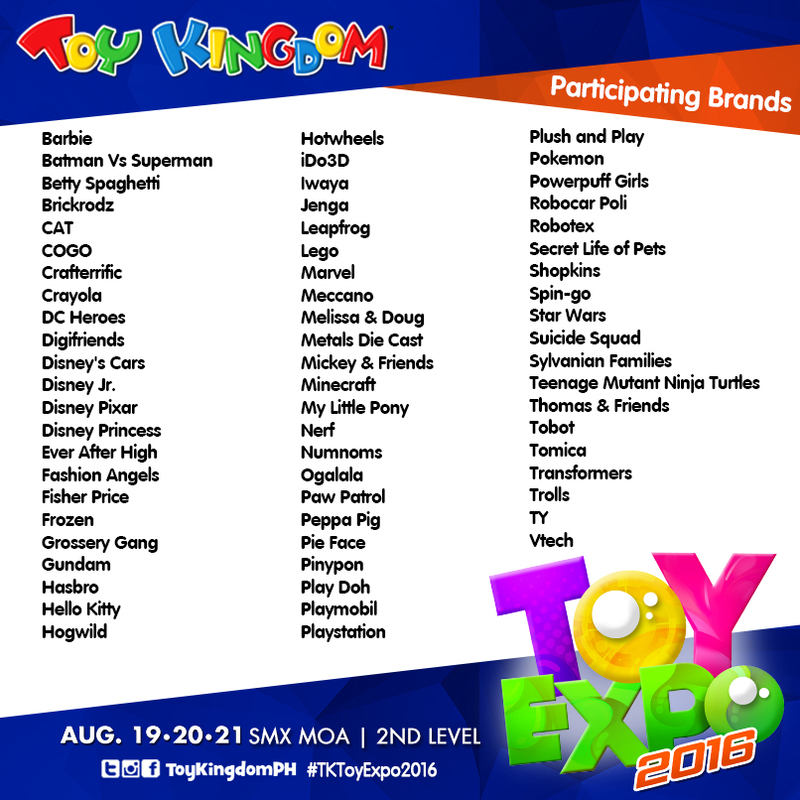 Visit www.toykingdom.ph; official event hashtag: #TKToyExpo2016; follow ToyKingdomPH on Facebook, Twitter and Instagram. See you there, mga mare!